MV Manta Queen 2 Liveaboard offers a unique option for divers who want to get in the water to experience the best diving Thailand has to offer. 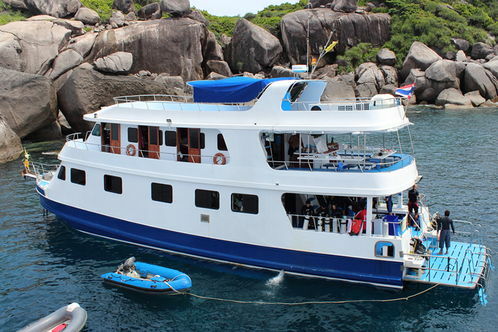 Her 3 days and 3 nights dive & cruise program avoid the large number of boats which sometimes fight over the best Similan Islands dive sites, and sail north to the slightly more challenging diving destinations of Ko Bon, Ko Tachai, and the world-famous Richelieu Rock. On the way back, she stops off at one or two wreck sites to perfectly finish off the cruise. Manta Queen 2 Liveaboard is a professionally-run boat that offers air-conditioning, excellent food and lots of comfort and safety features. There are 3 types of cabin available, including 4-bunk shared, twins and doubles cabins. Every trip went as smooth as silk, with the fun but professional team of western diving staff and local crew taking good care of everyone on board. You don´t need to be a professional or highly-experienced diver to enjoy the more challenging dive sites which the trips visit, Recommended levels are Advanced divers and those with more than 20 logged dives so will be able to enjoy your dives longer than inexperienced divers. To book your Manta Queen 2 Liveaboard diving holiday, please contact us to check availability. On receipt of your reservation request and if there is available cabin, we will hold the place for 48 hours. However, the booking will be final only after receipt of payment. Bathrooms are shared and not en-suite.